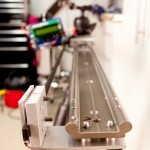 I built my slider based on Vimeos user “XCM” who in turn based it on Stage Zero Dolly. 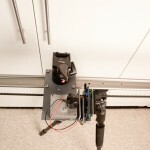 Igus slider rail is main chassis holding everything together. 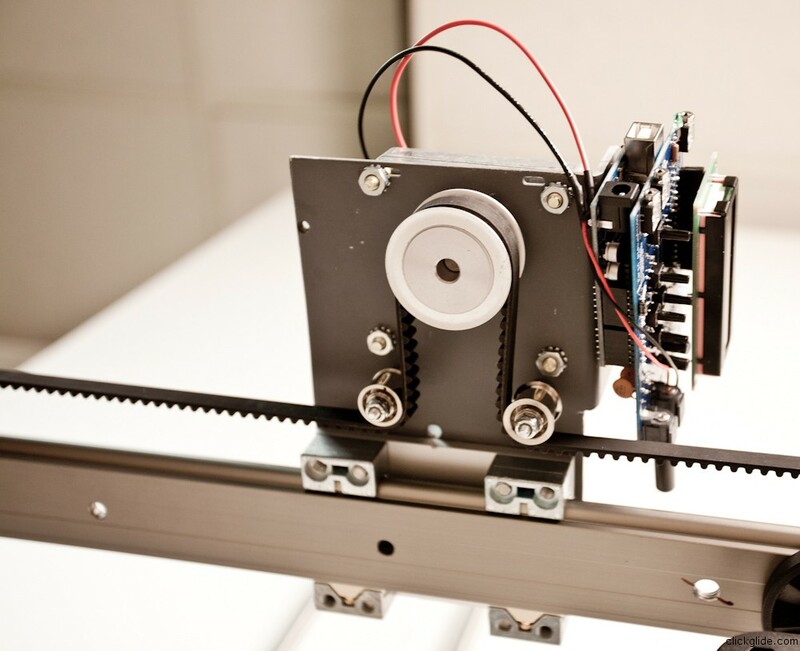 Special platform attached to the igus carriage platform has geared motor and set of pulleys. 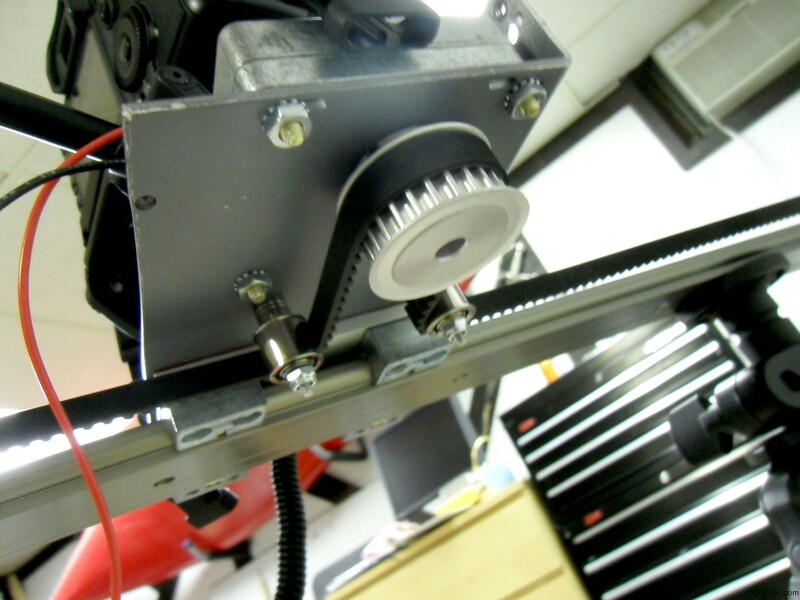 It moves itself along HTD-5 timing belt that’s attached to the rail at each end with clamps. 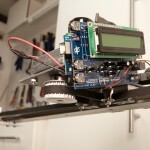 Whole system is driven by MX2 Dolly shield and Arduino. 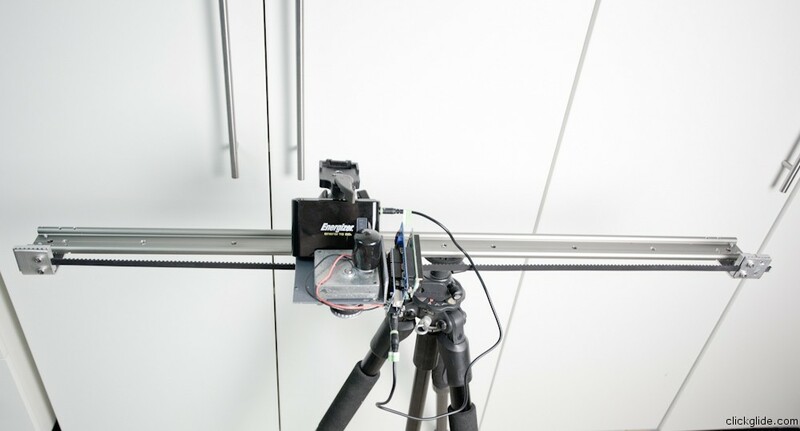 It’s capable of capturing a movie while it’s moving horizontally or vertically (yes it’s that powerful) and controlling camera’s shutter for a time lapse photography. If you just read only this part of my blog it will be worth it. Finding all the parts in USA was a nightmare, but I managed to locate them! Because whole system is built around HTD-5 timing belt (High Torque Drive with 5 mm pitch) I had to find right timing belt pulley. But here’s the issue. Belt is metric so pully is metric to, however gear motors that I could find have shaft of 5/16″ which doesn’t fit any HTD pulley I could find. 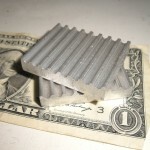 Fortunately a company in Long Island, NY makes metric pulleys with imperial cores! 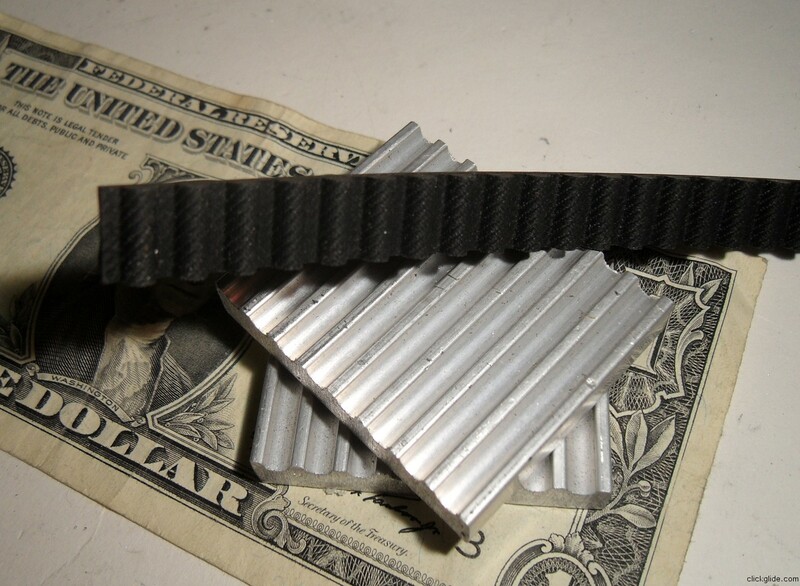 And they sell timing belts too! 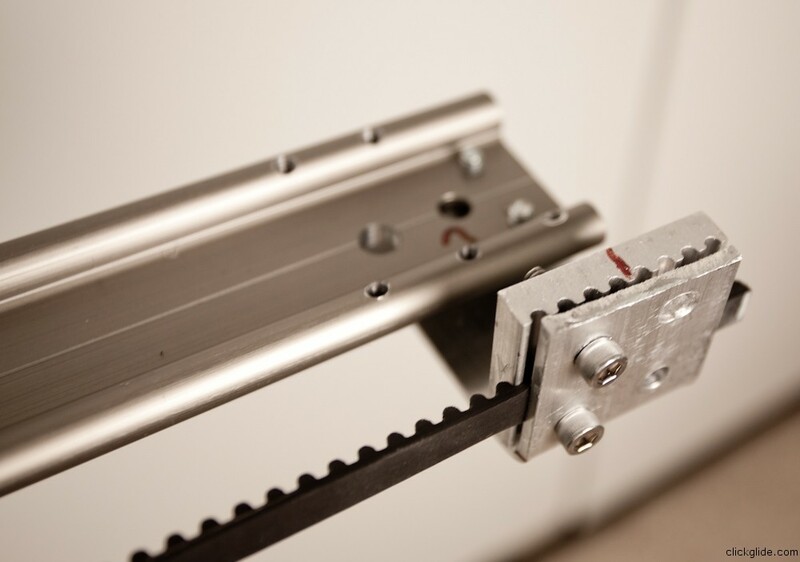 Another problem I encounter was with belt clamps. 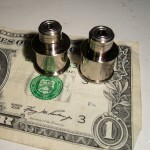 Very few companies sell HTD clamps, and the price they charge for them is astronomical. 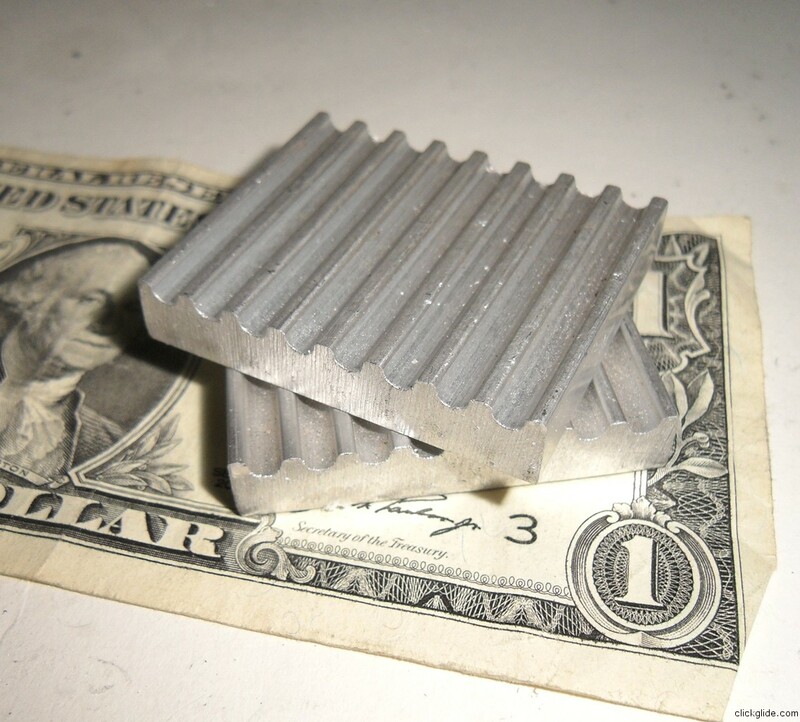 $60-90 per clamp, which is nothing but a small aluminum plate with ridges. It probably took me a week to find a company in New Jersey that makes these for just under $8! Not all parts were off shelf. 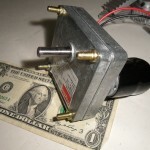 Motor mount was made from old power supply cover which was made out of thick aluminum. 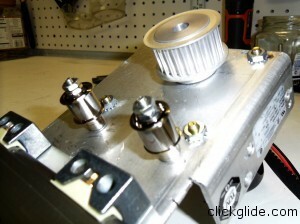 Tension rollers were taken out of DLT tape drive but you can also find similar rollers inside VCR. * They charge extra fee for handling on small orders. Total Cost for me was around $320 without tripods/heads. Post a comment if any of the links don’t work. The most useful power tool for this project is without a doubt a drill press. Mine is 10″ Ryobi and I got it for under $100 at home depot. Currently is the most used single piece of equipment in my basement, I strongly suggest you get one if you have room. Soldering iron, lead, cutters, wire strippers, 3rd hand tool, wires, etc. 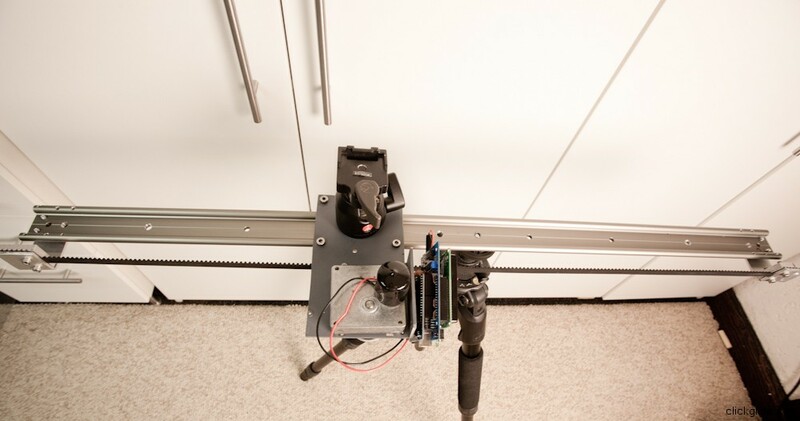 If your Igus slider is not pre-drilled you will want to drill and tap a 3/8-16 thread hole in the middle of carriage plate for the camera’s head. In the middle of the rail I made another 3/8-16 thread for attaching rail to tripod. If you plan to use two tripods make two more holes/threads on each end of the rail. 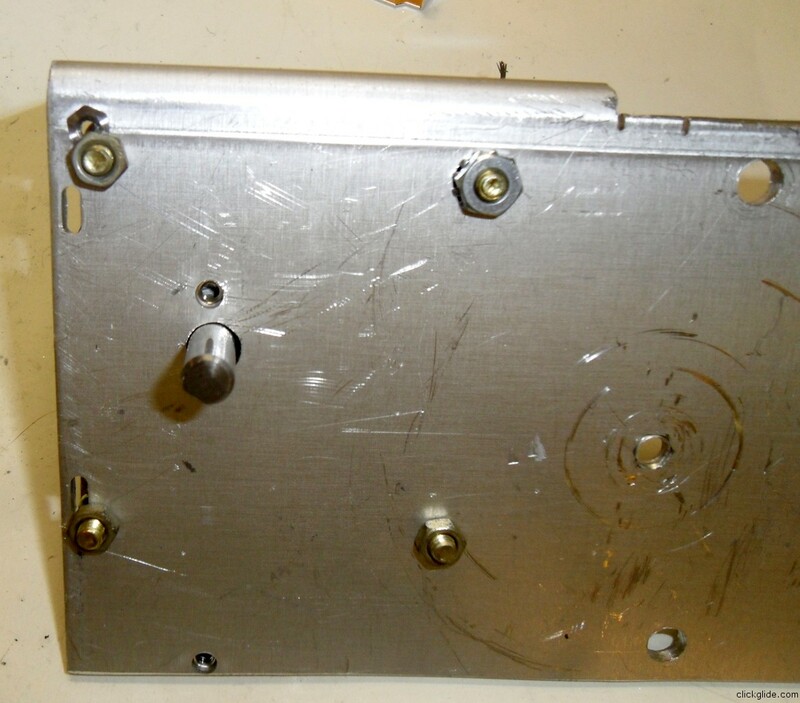 It might be a good idea to use 1/4 thread instead of 3/16 if your quick-release plate doesn’t have 3/8-16 screw. 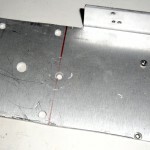 Take your aluminum plate and cut out approx 100x180mm rectangular piece with hacksaw. Use special blade for metal. Adding a little cutting oil to it will help along, but might create more mess. Cut edges will be rough so filed them down to smooth finish removing any sharp pieces. Next I drill holes for attaching mount to the carriage. 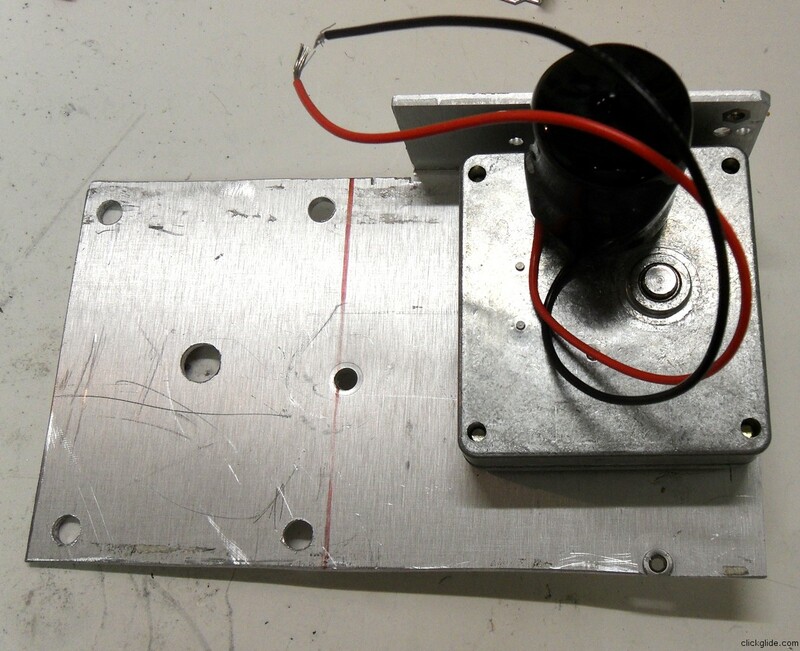 To do this take carriage off the rail (removing all 4 hex machine screws), and used it as template to mark the 5 holes on the motor mount. 4 for the corner screws and one in the middle for the head screw. For corner screws I drilled over-sized holes with 7/32″ drill bit, and for the middle one I used drill bit large enough to clear 3/8″ screw. Before drilling large holes it’s recommended to use small size bit to drill pilot holes. After cleaning holes with round file, try it on the carriage platform to make sure it fits nicely. If your holes misaligned slightly you can make them bigger, just make sure they are not larger than machine screw heads that will hold them. 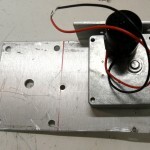 Next mark 5 holes for attaching gear motor. Drill them, making central one big enough to clear 5/16″ motor shaft. 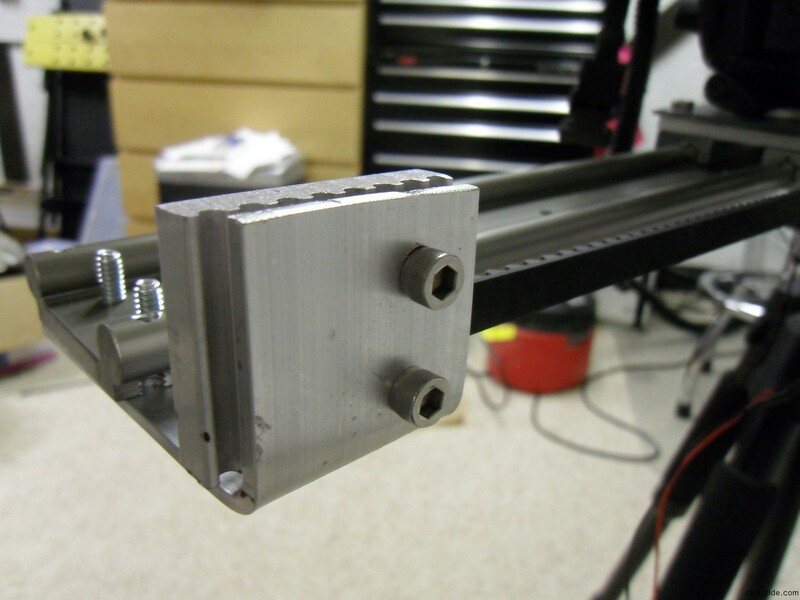 If everything aligns secure motor with nuts to the mount. 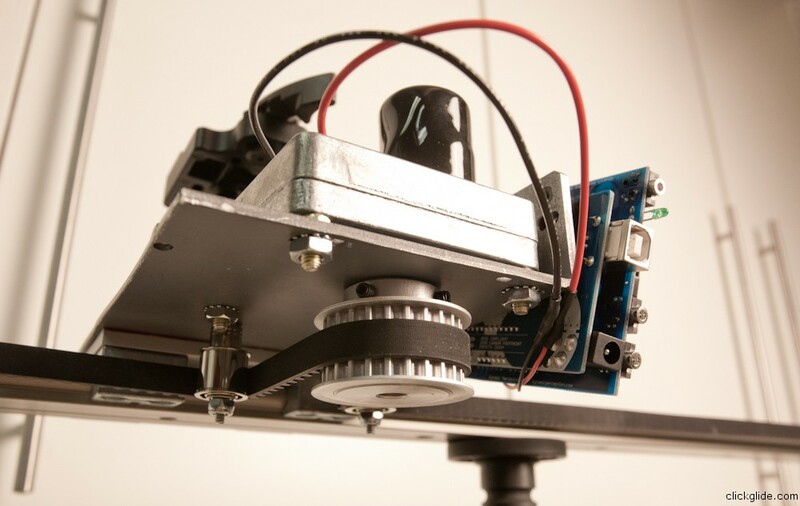 Find good spots for the tension pulleys. Make sure they won’t interfere with Igus rail or tripod’s head. This is how I placed mine. 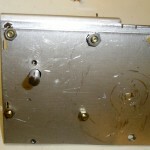 Drill and tap holes for the right size screw that will hold them, and secure with screws and nylon lock nuts. Don’t make it too tight, they should rotate freely. 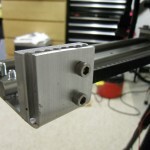 Belt is held at each end of the rail by aluminum clamps attached to an L-bracket, which in turn screwed on to the rail with two 10-24 machine screws. You need to be careful with making those to make sure they are right distance from the rail and right height. Good idea would be to attach L-brackets with woodworking clamps, use more clamps to hold timing belt and thread it thru all the pulleys. This will tell you distance from the rail that belt needs to be held. Also notice which way belt’s grooves will be facing. I made a huge mistake by putting those brackets backwards and had to completely scrap and buy aluminum from home depot (a $12 and day and half worth of time mistake). 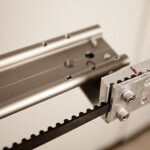 On my setup, belt got to be about 3 cm away from the rail, and on the same level as rail edge. 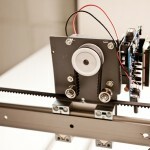 To make L-bracket cut from a flat strip of aluminum I 11 cm long pieces and bent them at 7.5 cm mark to 90 degree angle. 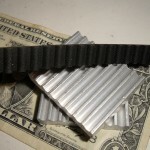 Use hacksaw to cut aluminum. To bend it put it in the wise and use rubber mallet and whack the heck out of it until it bends. Make sure it’s straight in the wise, or your bent will be crooked. Drill and tap (10-24 thread) two holes on each clamp. Make sure distance between them is sufficient to fit 9mm timing belt, and also try to make lowest whole as low as possible. You can make 4 holes if desired, or cut each clamp in half (they are too long anyway). Now using it as template mark holes on the short part of the L-brackets and drill large holes in the brackets with 7/32 drill bit. 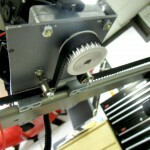 Your 10-24 screws will go thru L-brackets and screw into clamps from the ridged side. Drill and tap 2 10-24 threads on each side of the rail. Using it template mark holes for the L-Brackets and drill brackets with 7/32 drill bit. This is where screws will go in that attach brackets to the rail. You can attach whole slider directly to tripod via 3/8″-16″ thread, however it’s very cumbersome and you can’t really change rail angle. So for best result attach it to a head. 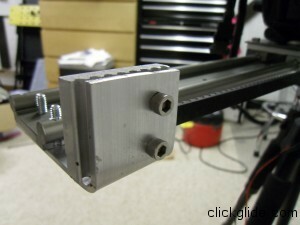 Then your second head (for the camera) will go on the igus slider carriage platform attached via short 3/8″-16″ screw. 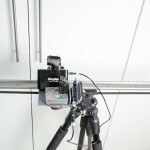 I already had pretty heavy Giottos tripod with Manfrotto 701HDV video head. But surprise surprise, whole setup with Canon 5D MkII camera and 24-100mm lens was too heavy for 701HDV head so it would not hold when camera was closer to the rail end 🙁 It looks like head that holds more load is needed. I think Manfrotto 501HDV will do. I will use my 701HDV for the camera. Initially I had a lot of issues with DollySheild controller, and didn’t get it to work as neeed yet , but eventually got it working with some modifications to the hardware and code which I will not cover it in this post. I am considering using the MX2 as a controller for my slider project…you said there were problems. What difficulties did you encounter? Jay has been great in answering my questions. 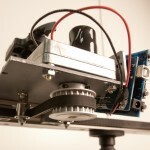 I had 2 issues, both because of arduino uno R2 edition. First, it would freeze after turning off and back on. Second was due to not being able to load firmware due to its large size. Somthing about my version of bootloader. I fixed both. First with diode, second with making code smaller by removing “merlin” functions. It works great now, i will post updatE shortly. i’m still looking for a battery, what did you use? 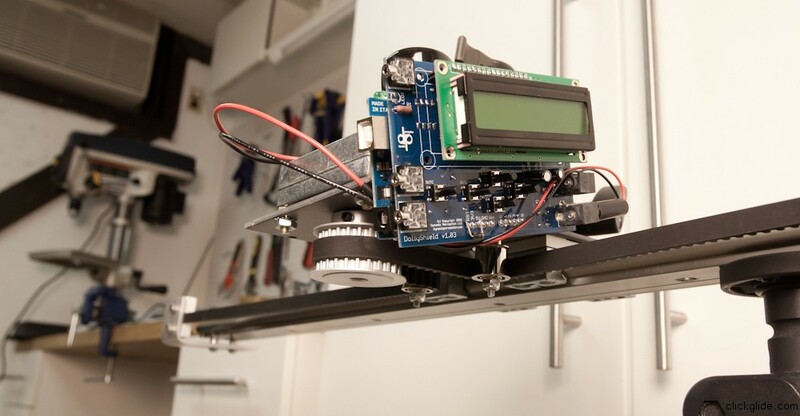 I’m making something very similar – using MX2 and Arduino Uno – and i’m running into the same issues you had with the Uno. Can you please elaborate on what you had to do to get the firmware uploaded? I haven’t had the freezing problem yet. Thanks for the great tutorial. 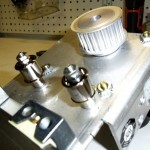 DollyShield build article is now online! Basically you need to make sketch smaller. 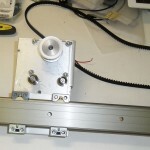 I did it by opening source code for the “merlin” module and deleted most of the code inside functions. Made sure it still compiles. Now sketch became small enough so it uploaded into Uno. I will post link to the modified code shortly. Hi – great article!! I appreciate the level of detail you’ve provided, and the parts/suppliers list is invaluable. It’s there. 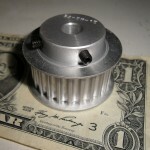 Go to Products -> HTD5 Belt Pulleys (http://www.econobelt.com/Q460/RFQ/default.asp?Page=Pg_1-151_1.html). 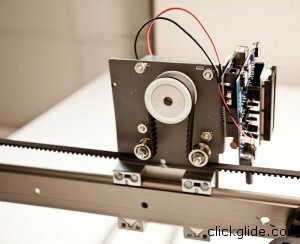 From Pull-down menu choose:Aluminum Double flange 24 to 40 teeth (it’s second item). P.S. Arlen, those are some incredible HDR photos you have! 🙂 Great work! 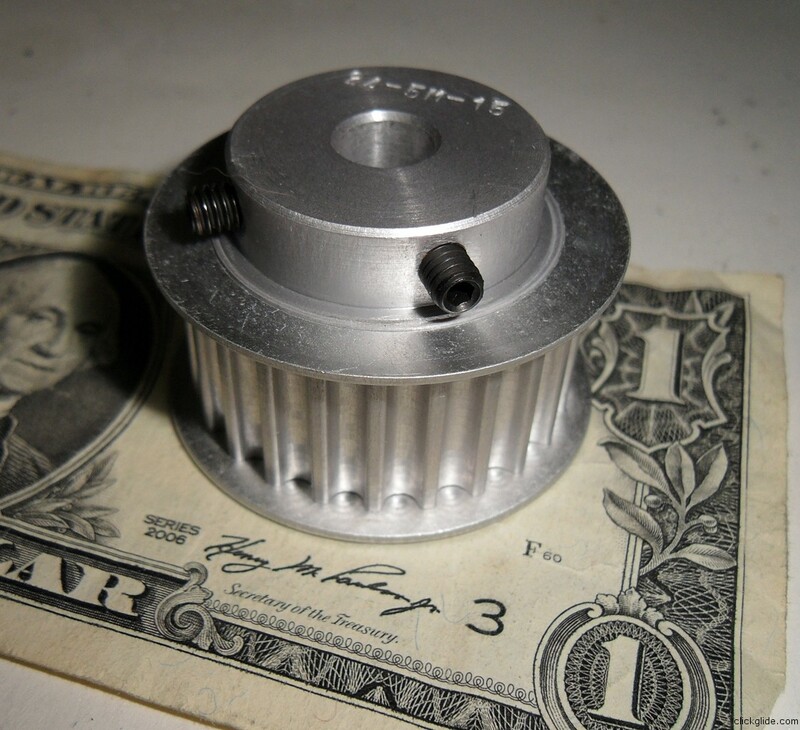 I ordered the pulley in aluminum and steel (QPEHTD5S15024F10) to see if there’s a significant difference in the amount of noise. Glad you liked the images!! It was Quantum DLT, but I don’t remember which model. I’m sure all of them have rollers, but they might be different. You can also use parts form old broken VCR (I think those will be even better). Thanks for the reply. 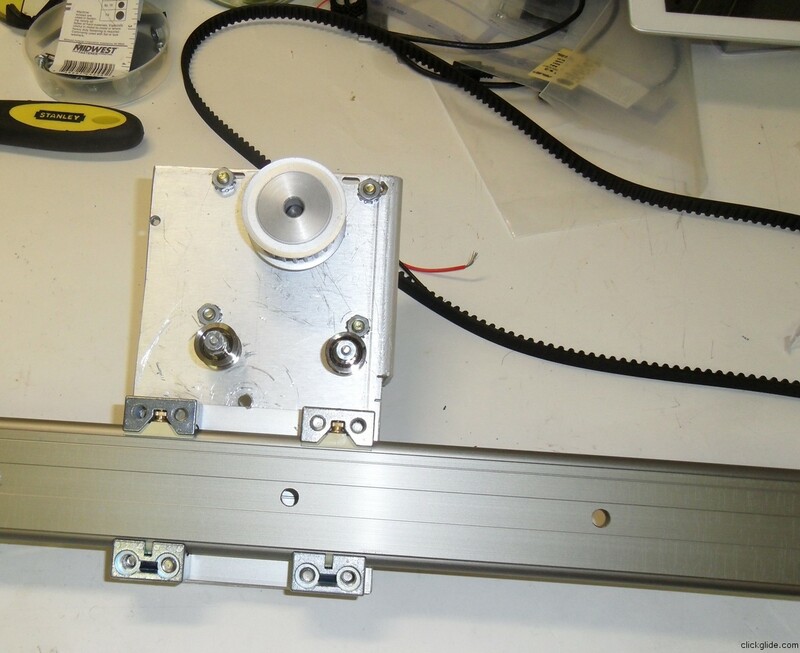 I ordered a broken Quantum DLT drive from eBay for $9, and I can see the rollers in the picture the seller provided. I looked into a bunch of old VCR’s at local thrift stores – but couldn’t see anything useful in any of them. All the later models went to plastic idler pulleys I think. How much battery life do you get out of that Energizer XP8000 you use? Would you recommend to get that one or something else? I saw you mentioned something about 9 volt being better…whats that about? Thanks for being so specific. I had seen XCM’s and a few other sliders but really couldn’t keep up without more specific instructions. You really nailed it. Thanks! Sorry for late reply, my WP stopped sending me notifications on new comments for some reason, I just saw it. I actually wouldn’t recommend XP8000. I didn’t have a chance to use it for long time, but it looses charge pretty fast. Even when I wasn’t using it it kept discharging. There are better packs out there with more suitable voltages. Also, a quick note about the belt clamp. You can buy them on the same QTC site as the timing belt and pulley. I ordered two but I suspect one will be long enough to cut in half. It’s the second one up from the bottom, QBCLMHTD5090. mydixonsider, let me know if you got those clamps working. I also bought them, but couldn’t use it because they made for clamping belt ends together and not for attaching belt to another surface. Quick question. I’m planning to make this same setup but to begin with it’s going to be more for live video, later down the road I want to rig it with the MX2 for time lapse stuff. Right now I want a controller with a big knob that you can ramp up and down the speed, as well as move both directions without a switch. I’m not incredibly wiring savvy, so do you see anything wrong with this controller I found working with the linked motor? 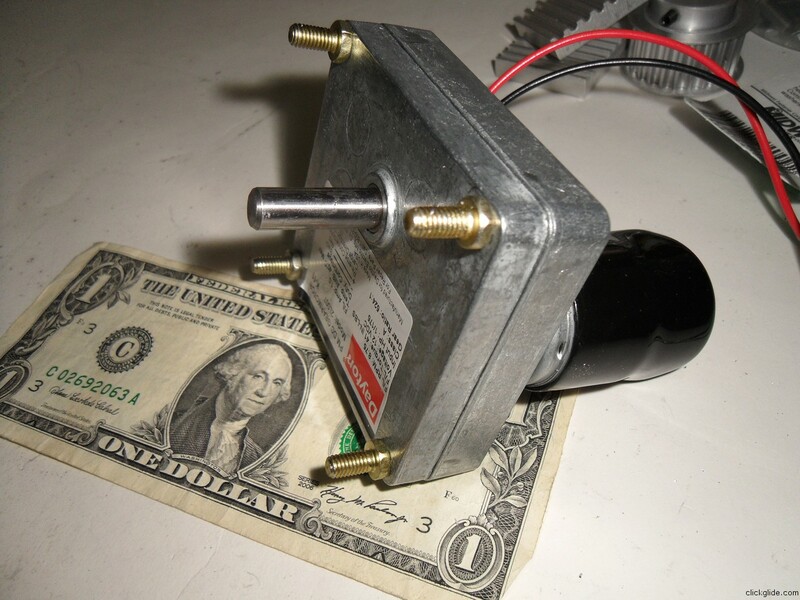 I might actually get a higher RPM motor as well to do faster movements. That controller looks like it should work with the setup! 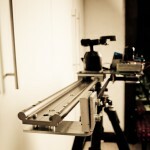 The Igus slider which you have used is 3 feet, i would like to know whether there is a 6 feet slider available? Sorry for late reply. Yes I believe Igus makes rails of pretty much any length. 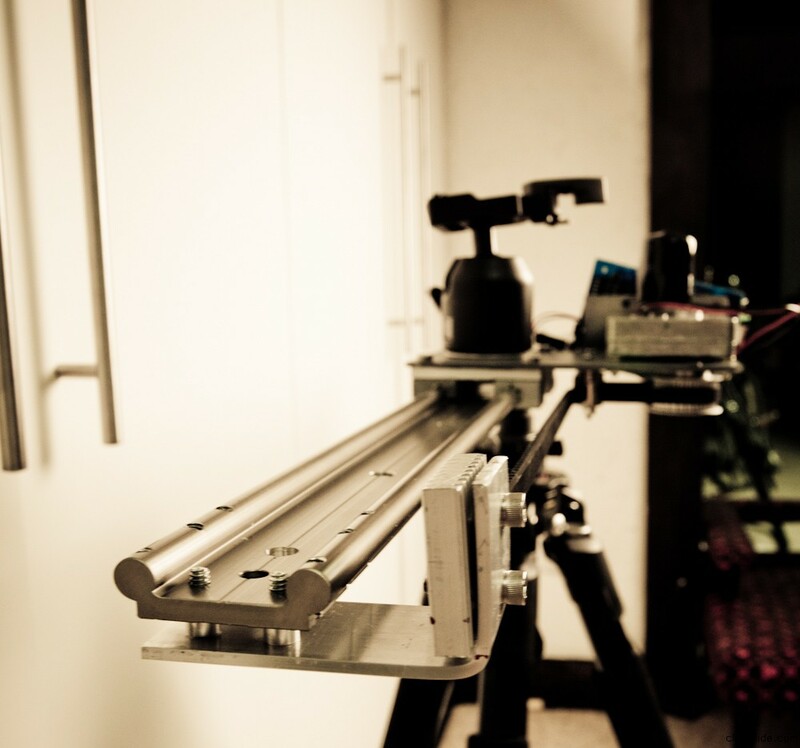 I would like to know if you will sell the Motorized Slider with controller and tripods/heads in full ready to use finished product? I come from Hong Kong and planning to start a small business about photography. I cannot find the slider as good as yours. outlooking is doesn’t matter. Could you be so kind to help? Hi, i’m just starting to build my slider. 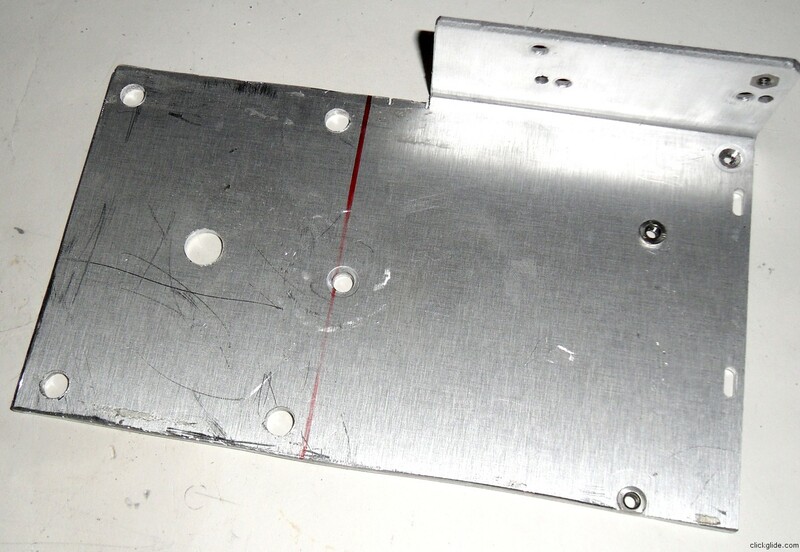 Would you be kind enough to share the dimensions for the aluminum plate, including the drill holes and sizes?